Only recently has the tennis world become used to Denis Shapovalov’s name and most don’t know exactly how to pronounce it. “When referees see it on paper, they panic. Once I was called Sharapova," the 18-year-old Canadian was quoted as saying last week. “It’s been like that all my life. My parents told me people are never going to get my name right. It’s pretty funny the different ways people pronounce it. There are a lot of Os and As. It’s intimidating on paper." What the name stands for now will be even more intimidating for the Indian team, which is heading for Edmonton for the Davis Cup World Group play-off starting 15 September against Canada. Shapovalov is not just a name in fashion but in career-changing form. Having won the boys’ singles title at Wimbledon in 2016, he has charged up the professional charts this year. He defeated Rafael “Rafa" Nadal in an electrifying three-set contest in front of his home crowd at the Montreal Masters. He followed it up by qualifying for the US Open and making it as far as the fourth round last week. En route, he defeated eighth seed Jo-Wilfried Tsonga. Shapovalov is left-handed and wears his blond hair shoulder-length, like the young Rafa. But it’s his fearless hitting that has become more of a style statement. “He is obviously the real deal with all the results he has had at his age," says India captain Mahesh Bhupathi on email. “We had Prajnesh (Gunneswaran) and Divij Sharan in the camp," he adds, referring to the two left-handed players who sparred with Yuki Bhambri and Ramkumar Ramanathan. Shapovalov, whose world ranking jumped from 250 at the start of the year to 51 one this Monday, will be the spearhead of the Canadian team, which includes Vasek Pospisil, doubles veteran Daniel Nestor and debutant Brayden Schnur. The teen may feel an added responsibility to take his team back in the 16-team World Group. Shapovalov’s outburst had led to his team’s default 2-3 loss against Great Britain and saw them drop to the play-offs. In the World Group first round in February, Shapovalov was trailing Kyle Edmund 3-6, 4-6, 1-2 when he slammed a ball that hit the chair umpire in the eye after a line-call dispute. Canada had to concede that deciding rubber and the tie and Shapovalov was fined $7,000 (around Rs4 lakh). “For him, that February incident is far behind," Canadian captain Martin Laurendeau, who now also coaches Shapovalov, told the press. “I think he’s shown that he turned that experience into a very positive one. He’s the first one to mention how it’s made him a better player and a better person. He’s moved on pretty convincingly from that experience." Though India will run into a player in hot form, the hosts will be without their No.1 player Milos Raonic, who is out with a wrist injury. Bhupathi has had some beginners’ luck—when he made his debut as captain in April, Uzbekistan had also travelled to India without their best player Denis Istomin and their young team struggled to fill in the void. Canada seems to be on sturdier ground, as both their singles players (Shapovalov and Pospisil) are ranked in the top 100. The 6ft, 4 inches Pospisil was ranked No. 25 in 2014 and has notched up a win over former No.1 Andy Murray this season. There is, however, burgeoning hope for an India team that has worked on building it’s singles strength for the past few years. Gone is the time when the Indian Davis Cup team would pin its fortunes on Saturday’s doubles to keep them in a tie. Under the captaincy of Anand Amritraj, the Indian teams have often gone in with a three singles and one doubles player combo, helping players like Bhambri and Ramanathan gain vital match experience. Neither of the players are Grand Slam regulars and Davis Cups are the only other tournaments where they learn how to win a five-set match. Even though India’s two singles players are ranked well outside the top 100 (Ramanathan at 154 and Bhambri at 157), they have produced some big results over the past quarter. Ramanathan, who has the big game to blow opponents off court but is still learning the levers of control, defeated then world No.8 Dominic Thiem at a grass-court ATP event in Antalya, Turkey. The 22-year-old from Chennai had entered the tournament as a qualifier and made it to the quarter-finals. He also made the main draws of the Citi Open in Washington and the ATP 1000 Masters event in Cincinnati, compiling a 7-4 record on the tour this season. 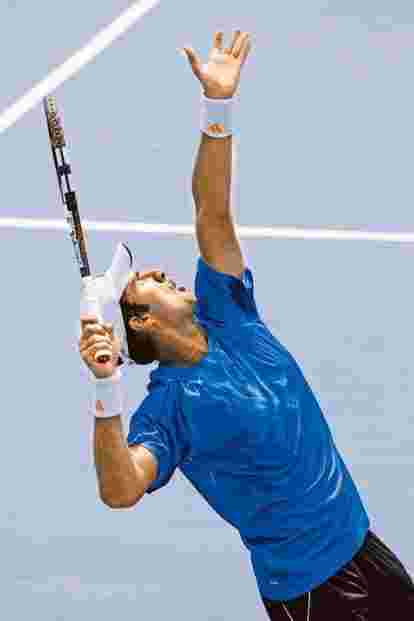 Bhambri’s moment in the sun came in an ATP 500 event in Washington in July-August, when he made the final eight. The 25-year-old subdued Frenchman Gael Monfils in three sets in the second round. He also battled valiantly against (Sunday’s) US Open finalist Kevin Anderson in the quarter-finals before going down 4-6, 6-4, 3-6. An aggressive base-liner, Bhambri’s court craft or confidence hasn’t ever been in question but his fragile body hasn’t quite been able to cope with the rigours. “They will only get better from here on," says Bhupathi. “In a few months they should be knocking on the door of the top 100." The Indian team had a week-long camp at the Columbia University, New York, to prepare for the Davis Cup tie, which will be played on indoor hard courts. The doubles rubber on Saturday could still prove crucial and India have decided to go in with Rohan Bopanna as the only specialist, leaving Leander Paes in the cold. As of now, Saketh Myneni has been enlisted to play with Bopanna but he has played only two tournaments since returning from a foot injury. India will have till the morning of the tie to decide on their final four, and have included Purav Raja as the second doubles option in the reserves. However, with the experienced Nestor, winner of eight men’s doubles Grand Slam titles, in their ranks, Canada are no duds in doubles either. The 45-year-old Nestor would most likely partner Pospisil, who has been a top-10 doubles player as well. India will play for a spot in the World Group for the fourth year in succession. They had taken on Serbia, Czech Republic and Spain the past three years, all on home soil. “It’s part of the Davis Cup charm," says Bhupathi, of playing an away tie. “I know a lot of players who prefer playing away since they feel less pressure." Playing in front of a hostile crowd is one thing, playing Shapovalov in front of his home crowd might be quite another, especially with the Canadians treating it as massive homecoming party for the teen. For his part, Shapovalov loves the big stage and a gaggle chanting his name, however they may pronounce it.